Bryant – On Saturday, April 21, the Student-Athlete Advisory Council (SAAC) will be hosting the fourth-annual Kids’ Day Out. The program, which is an interactive day camp for children ages seven and up, will unfold on April 21. Read more. Central Connecticut – The Blue Devils endured a long, 17-game road trip in the sport of softball, and now that it has finally come to an end, head coach Jeff Franquet sat down to talk about it. Read more. Fairleigh Dickinson – FDU received its eighth ticket to the NCAA Bowling Championships in the last nine years this week, and now the men’s tennis team hopes to eventually join the party. FDU men’s tennis, which last qualified for the NCAA Tournament in 2008, has been heating up of late. The Knights recently defeated A-10 member Fordham in dual match play. Read more. LIU Brooklyn – It was a busy week for LIU men’s hoops. Blackbirds’ star forward Julian Boyd was received an Associated Press All-American Honorable Mention and the sports information department released the final installment of the team’s NCAA Tournament photo blog. Read more. Monmouth – Coming off its third consecutive trip to the NEC Tournament, Monmouth announced its men’s soccer schedule for the upcoming fall season. The Hawks will begin their quest for the College Cup on August 27 on the Great Lawn in West Long Branch. Monmouth will welcome Big East member Providence to the Jersey Shore to kick off the 2012 fall slate. Like the Hawks, the Friars advanced into the NCAA Second Round in 2011. Read more. Mount St. Mary’s – The Mountaineers, who will be hosting the NEC Outdoor Championship come May, are welcoming seven other teams to Emmitsburg this weekend for the Eric Kloiber Track & Field Invitational. LIU Brooklyn, Robert Morris, and Saint Francis (PA) are the other three NEC programs in the eight-team field. Read more. Quinnipiac – Perennial NEC title contender Quinnipiac will host two Northeast Conference foes in Hamden this weekend. The Bobcats, who were tabbed first in the coaches’ preseason predicted order-of-finish, will welcome Mount to town on Friday and Monmouth on Sunday. Read more. Robert Morris – The Colonials closed out a memorable non-conference men’s lacrosse slate in style. In the first lacrosse night game in the history of Joe Walton Stadium, Robert Morris toppled Canisius, 15-11, to end a non-league schedule that included a win over nationally-ranked Ohio State. RMU owns a 6-3 record heading into its NEC opener. Read more. Sacred Heart – The Pioneers are the No. 14 mid-major women’s basketball team in the nation according to the season’s final edition of the CollegeInsider.com Mid-Major Top 25 Poll. Sacred Heart won its third NEC Tournament title earlier this month and went onto represent the NEC in the NCAA Tournament. The Pios, who earned a No. 13 seed, fell to No. 4 Georgia Tech in the NCAA First Round. Read more. St. Francis (NY) – The Terriers officially ushered in John Thurston as the school’s new women’s basketball coach. Thurston, who was the associate head coach of Brenda Milano’s staff for the past two seasons, was complimentary of his predecessor. Read more. Saint Francis (PA) – While the nation has been enthralled with March Madness, the Chris’ Villarrial’s Red Flash have been hard at work on the gridiron. Saint Francis will host its annual Spring Football Game on March 30. Read more. 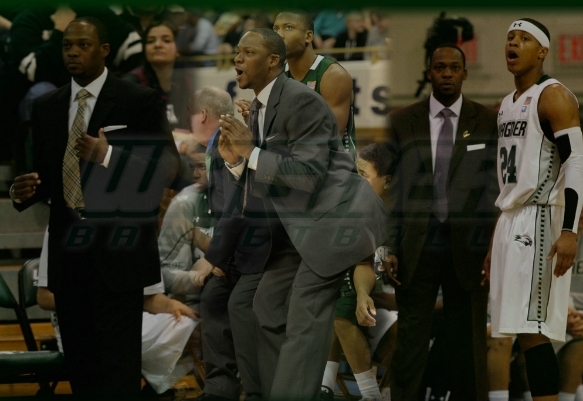 Wagner – Walt Hameline made a huge hire earlier this week when he tabbed Bashir Mason to take over the reins of Wagner’s men’s hoops program, but that wasn’t the lone transaction to unfold on Staten Island this past week. Hameline, who is both the school’s AD and head football coach, added a wide receivers coach to his coaching staff. Custavious Patterson will join the Seahawks after spending the last six seasons at Fordham with current Wagner associate head coach Tom Massella. Read more. Northeast Conference Bowling fans who were hoping to see a rematch of the Sunday’s memorable NEC Bowling Championship final may get their wish in two weeks. NEC finalists Fairleigh Dickinson and Sacred Heart received at-large berths into the NCAA Championship field when the eight-team bracket was uncovered on Wednesday afternoon. FDU has only once missed out on qualifying for bowling’s version of the “Big Dance” and will look to make its eighth ever trip to the Final Four come April 12-14 in the Cleveland suburb of Wickliffe, OH. Meanwhile, Sacred Heart is making its long-awaited return to the national title tournament. The Pioneers last contested the championship field in 2008. If all goes right, NEC bowling enthusiasts could be staring at their dream NCAA final matchup on Saturday, April 14. If so, they’ll get to see it on live TV along with the rest of America. The NCAA Championship final will air on Saturday, April 14 at 8:00 pm on ESPNU and will re-air on ESPN the following day. It was a huge weekend of bowling in the Northeast Conference, and if you missed it, you have A LOT of catching up to do. Six of America’s top-20 teams contested the eight-team field at the fourth annual NEC Championships. The No. 18 team in the nation, Saint Francis (PA), wasn’t even permitted to take part in the festivities since they finished ninth in the NEC regular season standings. It’s not a surprise that such a high-quality team would have such a low finish in the NEC. After all, there are no cupcakes on the conference schedule. In 2010, Fairleigh Dickinson won the NCAA national championship after finishing fifth in the NEC regular season standings with a 7-7 league record. Speaking of FDU, Michael LoPresti’s team carried the No .1 seed along with the National No. 1 ranking, into NEC Tournament play, but it was Sacred Heart, which left Bowl-O-Rama a winner. Sacred Heart, which held the No. 2 ranking in the nation before slipping to the No. 8 spot in the latest edition of the NTCA Top 20 Coaches’ Poll, was firing on all cylinders this past weekend in Reading, PA. The Pioneers went a perfect 4-0, including 2-0 vs. FDU, to claim their second NEC Tournament crown. SHU’s fourth, and final, victory, however, did not come easy as the Pioneers and FDU Knights battled in another epic NEC Tournament title tilt. NEC Bowling fans may remember, it was these two teams who met in the 2010 final and needed a modified baker roll-off tiebreaker to decide a champion. In the end, Sacred Heart recovered from squandering a 3-0 lead in the best-of-seven baker series and took the deciding Game 7 to achieve NEC supremacy and pad their NCAA Selection resume in the process. 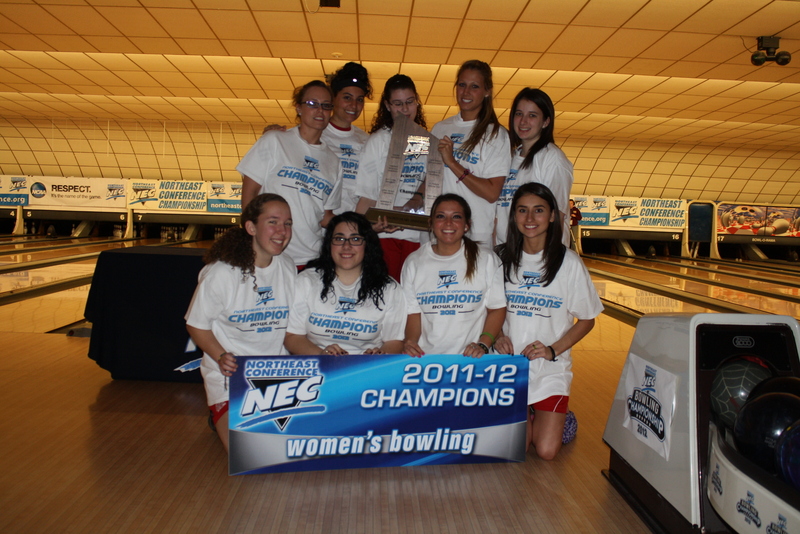 In addition to crowning a champion, the NEC also unveiled its postseason award winners and All-NEC Teams this past weekend at Bowl-O-Rama. FDU came away the big winner in Saturday’s midday awards presentation. FDU anchor Danielle McEwan made it back-to-back NEC Bowler of the Year honors, while Michael LoPresti snagged the Coach of the Year award for the second year in a row. Thanks to freshman Christina Leid, Saint Francis (PA) did have a presence of sorts at Bowl-O-Rama on Saturday. The NEC named the Keystone State product its 2012 Rookie of the Year. Mark Your Calendars Bowling Fans! Click here to watch the NCAA Bowling Selection Show LIVE. Young and hungry. The phrase applies to both Bashir Mason and Jamion Christian. Those two men, both of whom have yet to see their 30th birthday, were handed the keys to NEC men’s basketball programs yesterday. Mason, a St. Benedict’s (NJ) product, took over former his former boss Danny Hurley at Wagner. Christian, a Mount alumnus who played for NEC Hall of Fame coach Jim Phelan, returned to Emmitsburg to become the 21st head coach in the history of the program. In these two young men, Wagner and Mount hired familiar faces who understand the mission of both program and institution as a whole. On Grymes Hill, Wagner enjoys continuity from the short-lived Hurley Era. Mason followed Hurley from St. Bendict’s to Staten Island and was one of the men who recruited a number of the student-athletes on the Seahawks’ present-day roster. On the Mount, President Powell introduced someone who embodies the school’s spirit. In addition to bringing back a “man of great character” as Powell called him at yesterday’s presser, Mount St. Mary’s will also benefit from the great experience that Christian picked up on Shaka Smart’s staff at Virginia Commonwealth. Bashir Mason came home to the Mount. Both men may be young, but youth has by no means been a deterrent to head coaching success at the Division I level. In fact, Robert Morris fans have seen that right here in the Northeast Conference with Andy Toole. In his two seasons at Robert Morris, Toole, who was the youngest head coach in DI at the time of his hiring, the team has won 44 games and made two NEC Championship Game appearances. Oh, and that young guy over at Butler has done quite well for himself, too. Youth usually translates into energy as well, and energy, at all levels, is what programs need to succeed. Christian will use his Mount roots and VCU experience to mine into the deep talent pool that is Maryland and Virginia high school hoops for capable young men, who are looking to play the aggressive style he will employ. If Mason’s team does one thing, it will be playing DEFENSE. The former standout at Drexel has been about that seven-letter word since his playing days. He was a four-time member of the CAA’s All-Defensive Team and was the first man in league history to win the Defensive Player of the Year awards as a freshman. @dhurley15 – So excited for my former @StBenedictsPrep man Bashir Mason. Officially named Head Coach @WagnerCollege today at presser. Great day! Proud! @adamamin – Bashir Mason, 28, taking over at Wagner. Youngest HC in NCAA. Played for Bruiser Flint at Drexel so he’ll be tough defensively. @NescitOccasum – @MountAthletics Great week in Mount Athletics – Coach G and his men win @ Michigan and Mount alum Coach C takes charge of MBB! Go MOUNT! Wagner athletic director Walt Hameline and Mount St. Mary’s executive Lynne Robinson both fielded calls from coaches and references from all around America in their searches for a new head men’s basketball coach. As it turned out, however, both programs chose to fill the open positions by looking from within. Wagner decided to slide Bashir Mason a few seats up the bench, while Mount St. Mary’s dipped into its rich alumni base and found the up and coming Jamion Christian. While the Seahawks promoted Dan Hurley’s former assistant, the Mount chose Christian, who most recently an assistant coach for Shaka Smart at VCU and formerly a player for the legendary Jim Phelan. Both men will be introduced in official press conferences on Tuesday, March 27.